When a piece of jewelry is made of natural materials such as this neckpiece designed by Liv Blåvarp, it forges a special connection with the wearer. There is something about natural substances that bring out feelings of sensuality and an intimate connection on a deeply primal level. When Blåvarp began making jewelry in 1984, she sought to make structures that seemed alive. Her creations were specifically crafted to be large in order to naturally and elegantly follow the contours of the neck or wrist. Wood allowed her to work with larger volumes that do not become too heavy. 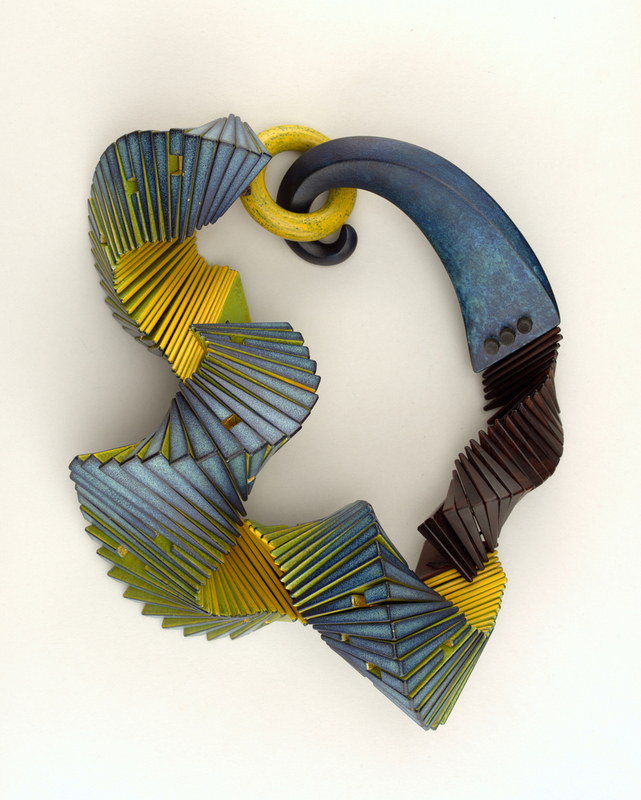 Flexibility is evident in the small wedge shaped wooden pieces that merge into a beautiful, vibrant, spiral form. Blåvarp believes in an intimate connection with her jewelry, and insists that works should have a sensuous appeal and that the maker’s emotions should play a part in creating pieces. This necklace is composed of birch and rosewood. Both of these woods are said to have natural healing qualities. Birch is known to be highly adaptive and able to survive harsh conditions, such as after a fire. Birch trees are eager to repopulate areas damaged by wildfire or other natural disasters – they grow where little else will grow. Poetically, this fits within Blåvarp’s approach to jewelry-making. Rosewood is also symbolic. Known for its sweet scent and resilience, a species indigenous to parts of India and Pakistan is associated with both physical and spiritual healing. Linked with compassionate energy and therapeutic properties, it becomes the essence of Blåvarp’s piece, in keeping with her intention for jewelry to function in conjunction with the body. To keep her pieces as natural as possible, Blåvarp used light toned woods, such as the birch seen here, stained with bright, vibrant colors, while her darker woods, like rosewood, are simply treated with oil to bring out their natural grain and color. The materials and bright hues in this neckpiece reflect a revolution in jewelry making that started in the mid-twentieth century. An approach that encourages experimentation with unconventional and new materials. Such work still flourishes in Blåvarp’s native Norway where she began her practice. Blåvarp cites fellow Norwegian designers as sources of inspiration. Collaboration with other designers allowed her work to have a genuine, organic feel. Just like the wooden modular pieces form a larger flexible whole, inspiration from fellow designers largely dictates her feel for the piece. With great patience, she experimented and developed her own techniques. To endure and not give up or lose sight of the goal is of utmost importance to Blåvarp. Drawing from natural sources and her fellow makers, Blåvarp created a form resembling a living organism that molds and flexes with the wearer – physically, spiritually, and as part of an intimate conversation between the wearer and the necklace. Erin Benedictson is an Alberta-Smithsonian curatorial intern in the Product Design and Decorative Arts department at Cooper Hewitt Smithsonian Design Museum. Reinhold Ziegler, “Liv Blåvarp: Touch Wood,” October 20, 2014, http://risekult.com/design/liv-blavarp-touch-wood. “Celtic Meaning of the Birch Tree,” http://www.whats-your-sign.com/celtic-meaning-birch-tree.html.